• The Egyptian coup, followed by inventory draws have kept oil prices bid but we wonder if triple digit pricing can last. Last month’s Egyptian coup (or whichever politically correct term they are using to describe the ousting of its government) lured speculators into bullish positions in crude oil. Later in June it was a surprise drop in crude oil inventory that added fuel to the rally. However, in a market that has a bad habit of reacting first and asking questions later, we wonder if traders have started to acknowledge their exuberance and are now feeling a sense of buyer’s remorse. After all, we’ve yet to see any risk of a Suez Canal disruption at the hands of a new governing body in Egypt, and we still have a healthy flow of crude oil being supplied to the market. Throughout the previous four weeks, well capitalized traders gobbled up long futures positions, while smaller traders were placing aggressive bets on higher crude oil prices through the purchase of call options. They use the option market because they either can’t afford to trade crude oil futures outright, or they don’t have the risk tolerance (and I don’t blame them). As is often the case during a bull run in crude oil, speculators were accumulating bullish positions with little concern over price or fundamentals. As a result, the price of oil rallied 16% and it appears as though prices ran to levels that are unsustainable in the long run; likewise, call option values exploded as traders irrationally bid them higher. Keep in mind, aside from the 2007 rally, any ensuing attempt for crude oil to trade into triple digits has been a short-lived venture. Last week’s price action signaled that upside momentum was waning, but there are a few red flags waiving that point toward a much bigger correction in “black gold”. Specifically, the latest stats released by the Commodity Futures Trading Commission (CFTC) detailing the size and direction of positions certain groups of traders are holding, revealed that speculators have amassed a near record net long position. Specifically, large speculators were holding a hefty net long position of about 361,000 contracts as of the close of trade last Tuesday. Remember, most active speculators lose money in the markets so if you are travelling with the herd, you might want to think twice about getting greedy. As we all know, the only way for a trader long crude oil to exit the market is to sell. Given the magnitude of the bullish bets in this market, the liquidation cycle could end in dramatically lower oil prices. 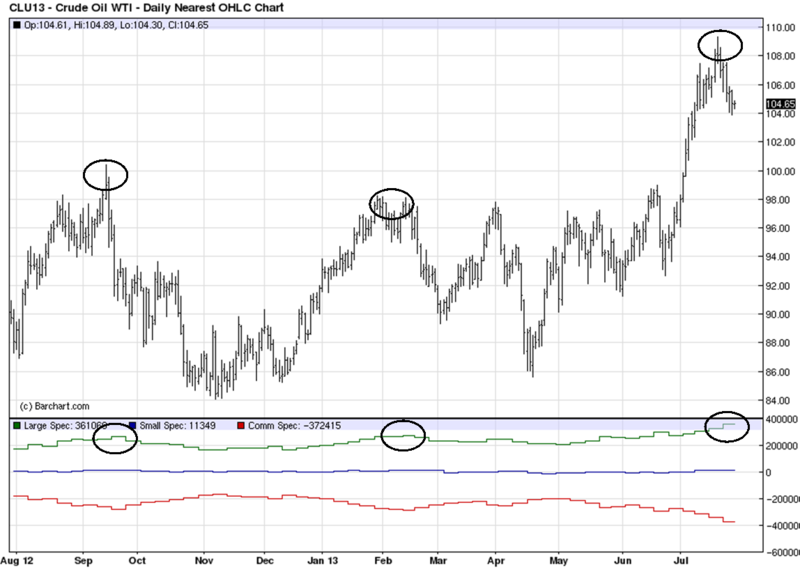 The last time speculators were holding such aggressive bullish bets on crude oil, the market peaked near $115 per barrel in May of 2011 and retreated to $95 in a few short weeks; in the subsequent months prices plummeted to $75. In the absence of renewed Middle-Eastern turmoil, we could see a similar vacuum in pricing. Throughout the 16% rally in crude oil prices, the option market has displayed an explosion of boisterous bullish sentiment. This isn’t surprising, but the fact that the phenomenon is reversing itself could signal a potential turning of the tides in the price of crude itself. Call options that were bid to unfathomable prices in the previous week, lost value in at an unprecedented pace. 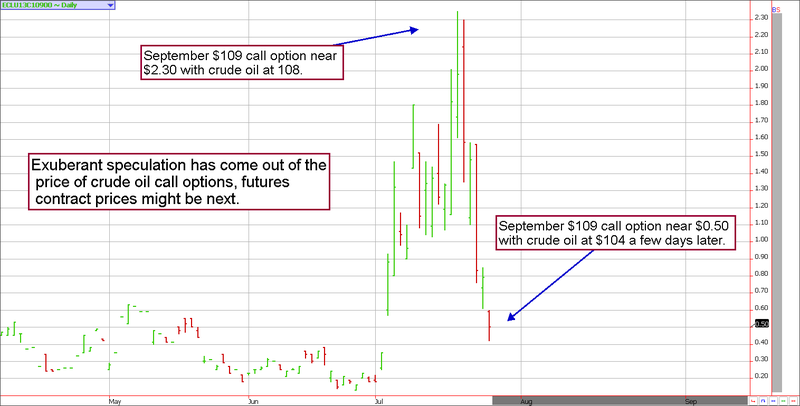 For example, the September $109 calls were trading at a premium of $2.30 (equivalent to $2,300) on July 19th with the price of crude oil near $108. The same option was trading for close to $0.50 (equivalent to $500) five trading days later with crude oil futures at $104. Naturally, call options would lose value in a declining market under any circumstances, but the fact that this option lost $2.00 in premium on a $4.00 move in crude oil paints a picture of careless bullishness which was subsequently followed by panicked selling. Knowing that crude oil option buyers are typically fickle small speculators prone to panic liquidation, we suspect the larger speculators who are holding long futures contract could be the next group to run for the exit. Aside from the market being vulnerable to speculator liquidation, crude oil fundamentals are relatively bearish. U.S. production of crude has seen a steady incline in recent years; from 2011 to 2013 production has jumped from 7.7 to 9.6 million barrels per day. Accordingly, net imports have fallen off by roughly the same quantity. Similarly, despite four consecutive weekly draw downs in domestic crude oil stocks, inventories remain well above the 5-year average. Another factor encouraging us to doubt the lasting power of the current rally is seasonal tendencies that suggest oil prices struggle to forge gains during the deep summer months. In most years, crude oil trades higher early in the summer but, late August tends to see rather significant selling as the summer driving season comes to a close. This leaves the market with a historically neutral to supportive bias in the short-term, but it certainly opens the door for swift selling in the coming weeks. Although we can never put a cap on investor enthusiasm, the chart is telling us the buying frenzy should be limited. 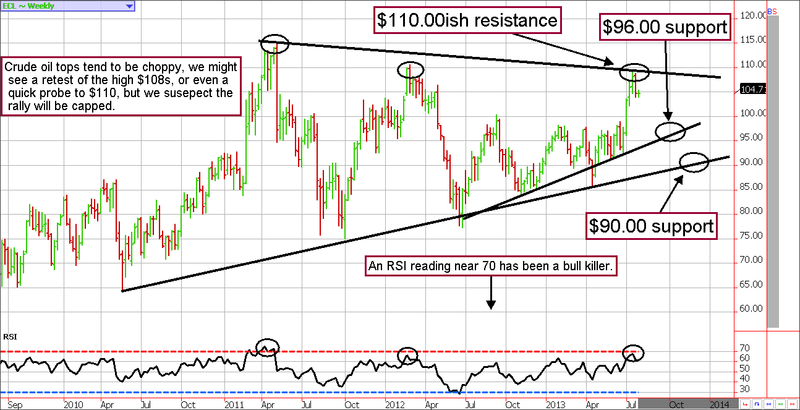 Thus far, technical resistance near $110 has held like a charm and we believe this will continue to be true. However, should there be a fresh Middle Eastern headline, we can’t rule out a quick retest of such levels. However, with that said we suspect the bears will have the last laugh; the best trades going forward will be taking a bearish stance on rallies. Not only has the dramatic multi-week rally left speculators all betting on the same outcome (higher prices) and vulnerable to liquidation, but it has also left momentum oscillators waiving red flags. For instance, the Relative Strength Index (RSI) which measures the speed and change in price movement has ventured into overbought territory. In fact, the weekly RSI in crude oil ended the week of July 19th with a reading of 67.60; which is a rather rare occurrence. Recent ventures into such territory have resulted in crude oil prices quickly succumbing to selling pressure (see chart). Taking a step back to take a look at the big picture, it is easy to identify a distinct contracting triangle formation. The recent high near $110.00 was brief and trigged a quick reversal; this level now marks the resistance area of the pattern. Once again, while we cannot rule out a “last hurrah” rally to retest the high $108.00 area, or maybe even $110.00 should we get a Middle-Eastern tail wind, but we believe the path of least resistance will be lower into trend-line support levels. We see minor support near $96.00 but it feels like a move into the $90.00 are is probable in the coming weeks, or months.